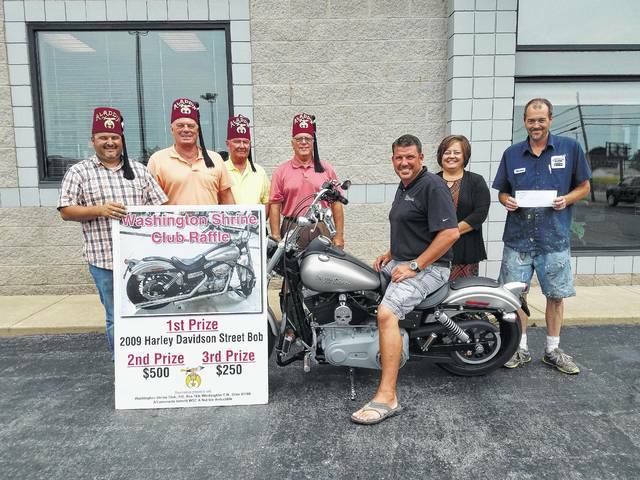 The Washington Shrine Club recently gave away a 2009 Harley Davidson Street Bob as part of a raffle to raise money for the club and the Shriner Hospital. Pictured (L to R): Washington Shrine Club President Keith Lippert, member Sonny Kearns, treasurer Steve Simpson, member Benny Jamison, motorcycle winner Brian Karnes, third place $250 prize winner Whitney Gentry and second place $500 prize winner Shannon Anthony. https://www.recordherald.com/wp-content/uploads/sites/27/2017/08/web1_20170801_130504.jpgThe Washington Shrine Club recently gave away a 2009 Harley Davidson Street Bob as part of a raffle to raise money for the club and the Shriner Hospital. Pictured (L to R): Washington Shrine Club President Keith Lippert, member Sonny Kearns, treasurer Steve Simpson, member Benny Jamison, motorcycle winner Brian Karnes, third place $250 prize winner Whitney Gentry and second place $500 prize winner Shannon Anthony.